During the 1950's and 60's, at the height of their popularity, drive-in movie theatres dotted the landscape of The Garden State. Here's some history and nostalgia, plus one big surprise. [/caption]Back in "The Day" there were almost 50 drive-in movie venues in New Jersey. Now, there's only one. For those of you who are familiar with the Atlantic City area, you're probably aware that The Delsea Drive-In in Vineland is up and running. The Delsea was originally in operation from the 50's until 1987. It re-opened in 2004 and is still surviving. All the rest are just memories. For those of us who can remember, those were some great summertime memories. New Jersey certainly has a claim to fame when it comes to drive-in movie theatres. The first drive-in ever was opened in Camden way back in 1933. It was The Camden Drive-In located on Crescent Boulevard. The price for admission was 25 cents a car plus an additional quarter for each passenger. There were no individual speakers at "The Camden." The sound was projected from speakers up by the movie screen. Back in those days I guess there weren't too many audiophiles around. Here's one, that looking back, sounds kind of scary. Located in Wall Township, it was Ed Brown's Drive-In and Fly-in. Yes, fly-in! Opening in 1948, the place had room for 500 cars, and get this, 25 small airplanes! There was an airport adjacent to the drive-in where the planes could taxi over and take in a flick. After the movie ended, the airplane was towed back to the airport. "United 747 to Wall control tower...permission for final approach to fly-in theatre." One of the largest drive-in's in the U.S. was in Newark. The Newark Drive-In had a capacity for a whopping 2,400 cars. The snack bar. Oh we can't forget that small building situated in the middle of the drive-in. To be kind, the menu was no rival for Le Cirque. There was the usual fare that included hamburgers and hot dogs that tasted like they were prepared a year or two in advance. Some locations offered a barbecue sandwich. You want to know the ingredients? No you don't. The safe bets were ice cream sandwiches, candy and popcorn. The date was July 29, 1966. The location was Loew's 35 drive-in in Hazlet. That evening was "Dance Nite" at the drive-in. That day there was a newspaper ad that read.."10th Anniversary Celebration"..."Dance Nite"..."Bring your wife or sweetheart to our big dance 7 to 9 pm"..."Live Band"..."then see a big double feature." Included in the double feature were, "The Russians Are Coming..The Russians Are Coming" (in color), and "McLintock" starring John Wayne. OK, cool, but so what? Here's what. That live band mentioned in the advertisement were the Castiles. A band member of the quintet was none other than "The Future Boss", Bruce Springsteen. On that mid-summer evening those sweethearts sporting their beehive hairdo's while dancing to the music of the Castiles didn't have a clue that one day one of those kids would eventually become a worldwide icon. The main reason for the drive-in's decline was real estate. 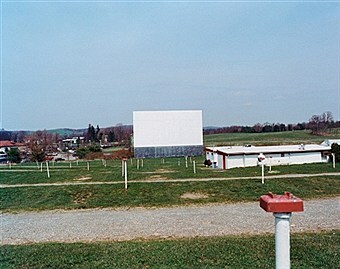 Drive-in's consumed acres of property. The property became so valuable that the owners sold it off to developers. Today many of the old sites have been converted to residential and commercial complexes. I'll bet you, or your Mom and Dad have many fond memories and stories about experiences at your old local drive-in. Please share them with us. I'd love to hear from you. And a very special thank you from me to noted Freehold Borough and Bruce Springsteen historian Kevin Coyne for his priceless information about the Castile's.